BMW completely redesigned the 5-Series for the 2004 model year, and the all-new models offer more room, more equipment and more sophisticated technology than the previous generation. The most important characteristics didn't change with the make-over. BMW's 5-Series remains a true sports sedan in any of its variations and boasts precise handling, impressive power and outstanding brakes. 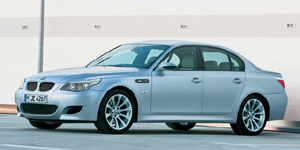 The 2005 BMW 5-Series Sedan is powered by a base 2.5-liter Inline-6 with 184 hp. Other available engines include a 3.0-liter Inline-6 with 225 hp, a 4.4-liter V8 with 325 hp and a 5.0-liter V10 with 500 hp.